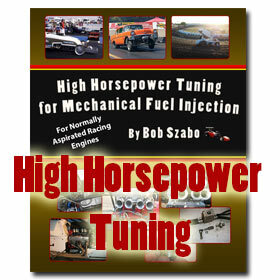 FUEL INJECTION TUNING HELP FROM THIS MANUAL: Racers throughout the world rely on racing mechanical fuel injection for high output power levels. Those polished stacks, scoop, or huge throttle body fed by individual fuel lines all indicate high power outputs. Tuning the jetting produces a win or loss, DNF or DNQ a race engine in one piece or broken. Simplify your tuning with easy to use lookup tables with detailed technical information. Math secrets to fine tune your jetting adjustments are revealed. • Additional jetting tables for various engine sizes.